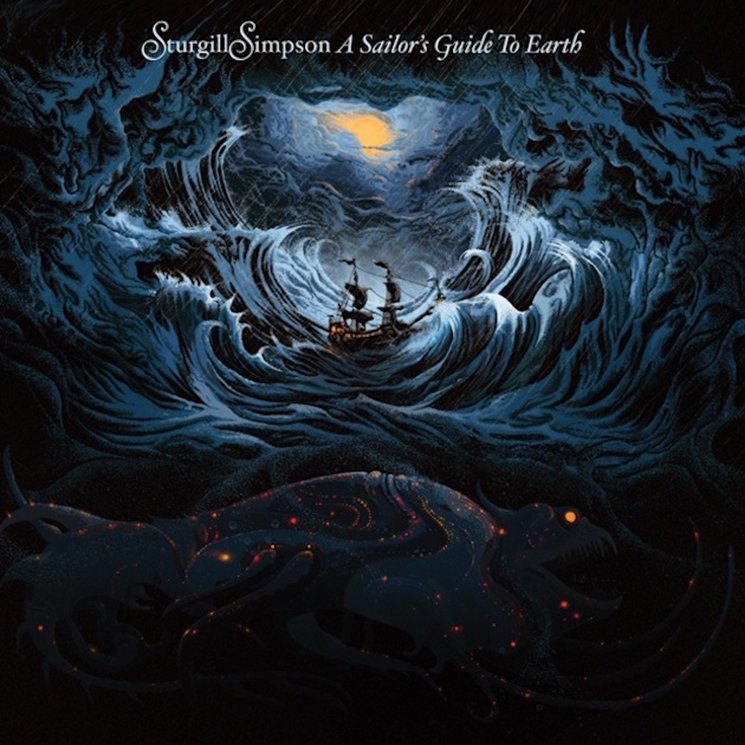 When Simpson’s last LP, Metamodern Sounds in Country Music, came out in 2014 it was a revelation: classic country with a mischievous psychedelic twist. I absolutely loved it. A Sailor’s Guide Earth is even better and makes Metamodern Sounds in Country Music sound conventional. I have been trying to figure Sturgill Simpson out on this new LP. He can sound conventional country in a rich Waylon Jennings baritone, but he can also go pop and sound like Roy Orbison. The album is country funk along the lines of Tony Joe White or Johnny Jenkins – arrangements are augmented by the Dap-Kings (the soulful/funky horns behind Sharon Jones and Amy Winehouse). To call this LP country or even alt-county is a red herring. A Sailor’s Guide Earth has more in common with 70s’ singer songwriters – the kind of genre bending that ambitious guys like Lowell George, Warren Zevon and Jackson Brown used to do. But there is something else going on here too and I couldn’t put my finger on it. Then I listened to a Joe Rogan podcast with Simpson and he spilled some of his not so obvious influences: Van Morrison, Marvin Gaye and Tool. Then it started to make sense – Simpson is swinging for the fences. Marvin Gaye elevated Motown to a new art form with his concept album What’s Going On. Simpson is doing the same to Nashville here. Van Morrison leveraged some pop hits to create a left field masterpiece with Astral Weeks. It was a commercial flop, yet it set the foundation for one of the most adventurous careers in pop/rock. I don’t have a link here, but I can see the same Van the Man aesthetics in Simpson. And Tool? Well of course they are thinking man’s metal – right up Simpson’s alley. The LP is a concept album – a time capsule of life’s lessons for his young son. And because we can all use some good advice it is universal. “Welcome To Earth (Pollywog)” sets the table for a great LP. Ambitiously arranged and orchestrated and with a whisper to a scream delivery. Simpson receives his son into the world. It is gorgeous and bittersweet. No sooner than his son arrives he as to say goodby and head off to the road. “Breakers Roar” is a gentle lullaby that Simpson sings in a soft voice. For me this song speaks to the seductive pull of career at the expense of family. Simpson then drops a gorgeous pop bomb by covering Nirvana’s “In Bloom.” The best part is that it does not even stick out – it seamlessly fits the album – it totally belongs. “Brace For Impact (Live A Little)” reminds us that life is short – no one gets out alive – so live a little, but don’t forget to give a little too. “All Around You” could easily (both musically and lyrically) be on a Van Morrison album. A warning that there will be bad days, but you can get through them if you remember Daddy loves you. “Oh Sarah” breaks the spell as the narrator needs to mend a tear with mom. The album ends with “Call To Arms.” It is a soldier’s angry rant: “They serve up distractions and we eat them with fries.” Musically it rocks. 2016 is just past the quarter mark and so far there have been several great albums. A Sailor’s Guide Earth will be on my short list of the best of 2016. An added bonus is that it is my great Nashville souvenir – I picked it up on release day at the Country Music Hall of fame on my last day in Nashville.